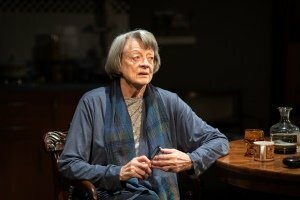 Maggie Smith (Brunhilde Pomsel). Photo Credit Helen Maybanks. Brunhilde Pomsel’s life spanned the twentieth century. She struggled to make ends meet as a secretary in Berlin during the 1930s, her many employers including a Jewish insurance broker, the German Broadcasting Corporation and, eventually, Joseph Goebbels. Christopher Hampton’s play is drawn from the testimony Pomsel gave when she finally broke her silence shortly before she died to a group of Austrian filmmakers, and from their documentary A German Life (Christian Krönes, Olaf Müller, Roland Schrotthofer and Florian Weigensamer, produced by Blackbox Film & Media Productions). Maggie Smith has had an extensive career in theatre, film and television. Her many awards include two Academy awards, five BAFTAs, four Emmys, nine Evening Standard awards and a Tony. She was made DBE in 1990 and a Companion of Honour in 2014.